Deptford was booming at the end of the 18th century, as the war against France created a huge demand for ships from the Royal Dockyard and the various private yards. But Deptford's second industry, market gardening, was also flourishing in war conditions, which meant that building land was in short supply. The many workmen with their families crowding into the parish created a great opportunity for an enterprising developer with access to a suitable site. The first to respond was Jonathan Lucas, who owned most of the land between Tanners Hill, Deptford Broadway, Brookmill Road, and Lewisham Way. The Lucas family had made money building and operating rice mills in America, and Jonathan Lucas was living in South Carolina at that time. Some houses were built in 1795 in what is now Albyn Road, but serious development did not begin until 1805. 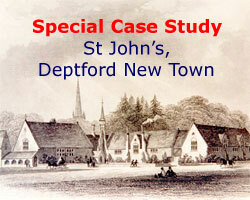 Between 1805 and 1815 several new streets were created in the northern part of the area, close to Deptford Broadway, and the name Deptford New Town began to be used. Early residents included many shipbuiders and sailors. The development was checked by the peace of 1815, and the decline of industry and housing demand that resulted, but the opening of the London and Greenwich Railway in 1836 began the age of the commuter in Deptford, and progress was resumed. 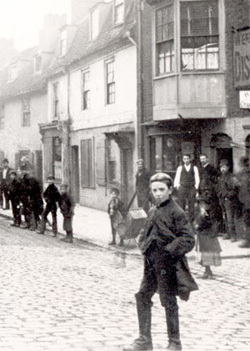 The houses built after 1840 in the eastern part of the area were generally of a better quality that those in the earlier streets. St John's Church was built to serve the new suburb in 1855. The site was the garden of the old Lucas family house, which itself became the vicarage. New Cross Gate and New Cross stations gave extra impetus in 1839 and 1850 respectively and the New Town estate was nearly completed before it got its own station, St John's, in 1873.